Mix the butter with the crushed garlic and basil, and salt and pepper to taste. Cut the dough in half, lengthwise. Spread the butter mix that you prepared over the surface of the dough. Cover the bread with the slices of tomato and cut the bread into individual slices before serving. If you want to give the bread a special touch, add slices of cheese before baking. When we’re looking for party food ideas, we always think about serving tempting appetizers. 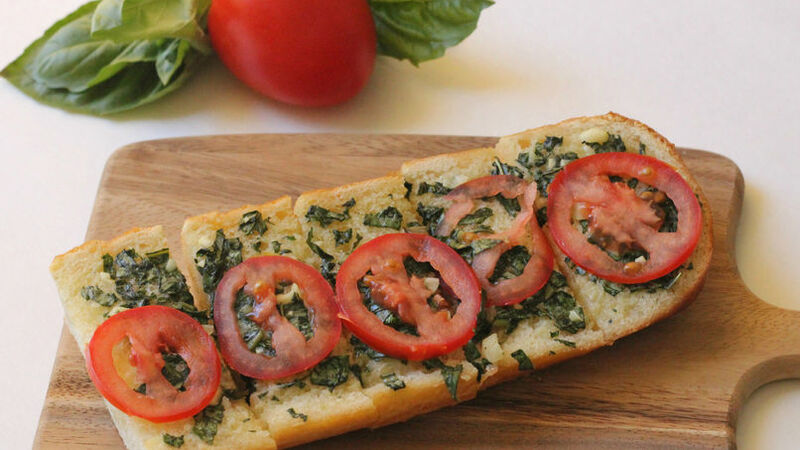 This garlic bread with tomatoes and basil is precisely one of those! No one can resist sampling these slices of bread straight from the oven, much less when they discover that the bread’s been smothered in exquisite herb butter. The aroma that will come from your oven as the bread bakes, in a matter of seconds, will attract unexpected spectators to your kitchen. This recipe is ideal to share on special celebrations, such as birthday parties or gatherings with friends. To achieve an even more flavorful effect, use Pillsbury™ French bread. It will save you when you’re in a pinch, time and time again!